FERGUSON, Mo. - Protesters returned to Ferguson streets Tuesday night, with smashed windows, clashes with police and possible arson coming hours after a makeshift memorial for Michael Brown burned. 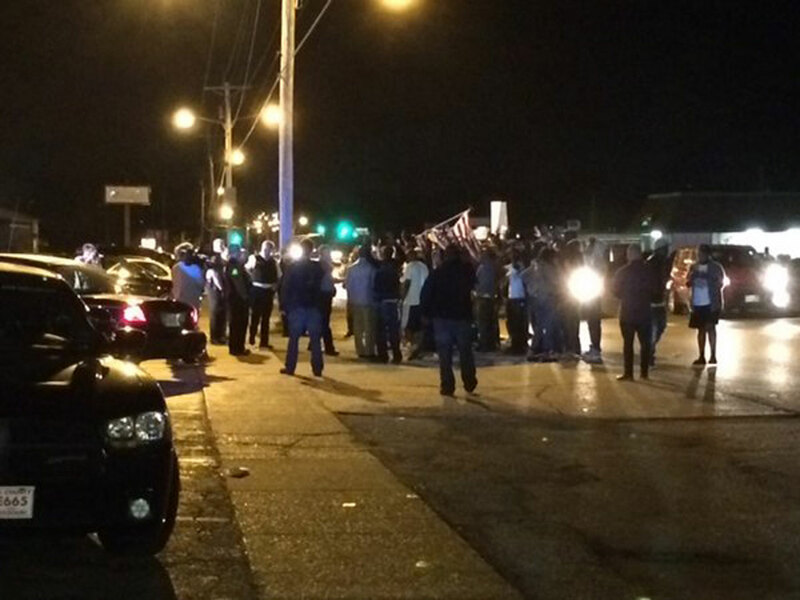 Officials said at least 5 individuals were arrested and at least two officer were injured. The St. Louis suburb was the site of sometimes-violent protests and looting in the days after 18-year-old Brown, who was black, was shot and killed by white Ferguson police officer Darren Wilson on Aug. 9. Up to 200 protesters gathered late Tuesday night. Windows were smashed at a beauty shop on West Florissant Avenue, where much of the looting happened last month. A small fire outside a custard shop appeared to be intentionally set, according to fire officials. Missouri State Police Captain Ron Johnson said at a press conference Wednesday that "there were several individuals who attempted to take the cash register out of" the beauty shop. The owner told several people it was the third time his store had been hit. Police began clearing the street around 12:15 a.m. Wednesday. Johnson said the decision to clear the street was made after individuals got in officers' "personal space" and began shouting threatening remarks. The police captain also said bottles and rocks were hurled at officers after they attempted to clear the streets. The St. Louis County Police Department said seven people were arrested, one business was vandalized and at least four officers were hit with rocks by the unruly crowd, reports CBS affiliate KMOV in St. Louis. St. Louis County Police said they received four calls for "shots fired" starting at 9:03 p.m.
Johnson said Wednesday "individuals shot at police officers" near Canfield Apartments, the site of Brown's shooting. "This behavior will not be tolerated," Johnson said. One of two memorials at the site where Brown was shot was destroyed in a fire early Tuesday morning. Police are investigating the cause of the blaze, but the fire renewed anger, especially among residents of the apartment community where Brown was killed. Several people who gathered at the scene Tuesday blamed police for not acting quickly enough to put out the fire, which destroyed teddy bears, signs and other items. The memorial site was quickly filled, becoming a new, and bigger, memorial. Resentment lingers among those who question why Wilson hasn't been arrested and remains on paid administrative leave. A state grand jury is weighing whether he should face charges but a decision isn't expected until mid-October. The Justice Department is also investigating. Obama: Ferguson showed America's continued "ethnic tensions"
At a speech at the U.N. in New York on Wednesday, President Obama acknowledged the situation in Ferguson, using it as an example of America's "willingness to criticize ourselves when we fall short." While Ukraine deteriorated and the Middle East got more violent, "I know the world also took notice of a small community called Ferguson, Missouri, where a young man was killed and a community was divided," the president said. "We have our own racial and ethnic tensions," he continued. "And like every country we continually wrestle to reconcile the vast changes wrought by globalization and greater diversity with the traditions we hold dear. But we welcome the scrutiny of the world."